A new basketball coach’s first recruiting class sets the tone for his tenure. For Josh Pastner, the first gem is Jose Alvarado, the highest rated basketball commit since teammate Tadric Jackson three years prior. The New Yorker has dazzled fans with his consistent hustle and court vision throughout the first 16 games of the season. That being said, Alvarado has yet to come into his full potential in the Pastner system, and by taking a closer look at the numbers behind his play, one can truly appreciate the talent just waiting to be unleashed. In baseball, a complete athlete is generally referred to as a “five tool player” due to their ability to perform in the five key categories: hitting, slugging, fielding, throwing and running. In basketball, it is simultaneously easier and harder to define what constitutes a full package guy. The term “two way” is the most surface level way to assess a player’s value; the only measure is an ability to contribute on offense and on defense. Too often this phrase is grossly oversimplified into an evaluation of whether a player can score or not while not getting scored on. Here is where the box scores will fail to tell the whole story: there are so many more metrics to use when measuring a player’s contribution to a team offensive scheme and a team defensive scheme besides what is in the points column. Looking at the numbers, Alvarado is not the obvious pick for the most valuable player on the team, or even the runner up. Despite being one of three players to start every game in which he has been eligible to play (along with Ben Lammers and Josh Okogie), Alvarado only leads the team in three statistics: assists, steals and free throw percentage. However, flashes of his hustle and dedication to finishing plays have been peppered throughout every game he has appeared in. The play that cemented Alvarado as a fixture for this team in the future was during the Wright State game after Tech had gone from an 11-point lead in the first half to a 49-49 tied game with a full 15 to go in the second. After clanking his free throw off the front rim, Alvarado exploded off the line, snagged the ball out of the air over five other players and finished the layup to try his best to keep Tech from losing momentum. Watching even a few minutes of Alvarado at late, it is hard not to be reminded of another 6’0”, 175-pound point guard: Chris Paul. Comparing a freshman with 16 total NCAA games to a first-ballot NBA Hall of Famer may seem like a bit of a stretch, probably because it is. And yet, watching Tech’s offense run, things operate more smoothly when the ball is facilitated by Alvarado. His quickness and size allows for aggressive drives and off-ball cuts to the basket that more often than not beat his defender to the spot, opening up another man elsewhere on the court. Yes, Alvarado’s assists have been lower than what is expected from a starting point guard with a modest 3.1 per game thus far in the season. However, not only is a hair over three assists a game enough to lead the team, there is not a single person that has appeared in more than 10 games that even cracks two assists per game. Alvarado’s role as the primary ball handler is to create open shots off the pass, whether it is his own entry look or two more touches down the line, and even though his teammates may not make all the assist-potential shots or take a few iso dribbles before shooting, Alvarado’s ability to space the floor is apparent. His flurrying movement on the offensive side of the ball paired with an acute court vision is what leads to sequences like his between-the-legs fast break assist to Lammers in the game against Yale. Alvarado’s role in the offense has proven difficult to replicate, which is probably why he has the third most minutes of any ACC freshman at 34.3 per game, and the second most on the entire team behind only Lammers. Tech offense has all the pieces it needs to rectify the pacing issues that were addressed in last week’s Technique. Despite being a true freshman, Alvarado leads the team by example in his constant movement on offense; even without being part of the play, his off-ball cuts and movement wears down a defender more than standing isolation offense ever could. It is reasonable to envision an offense reminiscent (in style, if not in production) of Paul’s Houston Rockets in which Alvarado, despite having the second-highest 2-PT shooting percentage and highest FT percentage on the team, does not need to shoot at a high volume to be effective. Instead, constant screens and cuts could open up plays for the red hot Okogie while Lammers dominates the paint on both sides of the ball (and perhaps shelves his oft-used mid-range jumper). 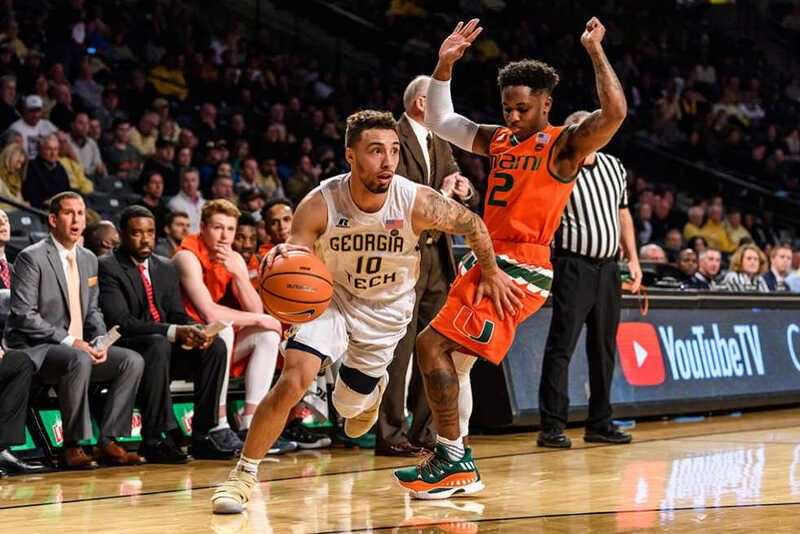 While changing an entire offensive scheme is unlikely, Tech fans should be excited for next season when Alvarado is paired with four-star recruit Michael DeVoe for an electrifying high-octane backcourt as Tech attempts to make the next step towards ACC title contention.